The Two-Headed Serpent: An Epic Action-Packed and Globe-Spanning Campaign for Pulp Cthulhu is pretty much up front about what it is. With a swagger and a quick swig from the hip flask, it swings into action, punches a Serpent Man firmly on the snout, and smashes its way through the Cthulhu Mythos—and out the other side in a campaign which will take the investigators around the world and back again. Written for use with Pulp Cthulhu: Two-Fisted Action and Adventure Against the Mythos, the supplement for Call of Cthulhu, Seventh Edition which combines Lovecraftian investigative horror with two-fisted adventure, weird science, dark deeds, and brave heroes, The Two-Headed Serpent takes its cue from classic campaigns of the past—Shadows of Yog-Sothoth and Masks of Nyarlathotep, in particular—in that its globe-spanning trek will see the heroes uncover and confront the forces of the Mythos, culminating on a tiny island. In doing so, they will travel from Bolivia, New York, Borneo, and Oklahoma to the Belgian Congo, Iceland, and Brazil—and beyond! 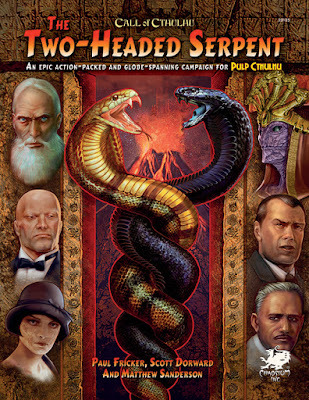 Published by Chaosium, Inc., The Two-Headed Serpent is upfront about what it is in three ways. The first way is Pinturero’s great front cover which shows you what campaign is about. Yes, it does involve entwined snakes—in more than the one sense; yes, it does involve a volcano—in more than the one sense; and it does involve all of the characters shown on the cover—in more than the one sense. The second way is the title, involving as both it and the campaign does, a lot of snakes. The third way is the set-up. The set-up is that the investigators—or heroes—are employees of Caduceus Foundation, a medical aid organisation with global reach and remit. The organisation employs all sorts of people, not just nurses, doctors, and scientists, but also those with social skills to talk to the people who can help Caduceus, those with the underworld or criminal skills and contacts to get people and supplies where they are needed, and of course, guides, drivers, mechanics, and so on. This allows a wide range of possible heroes (the pre-generated heroes include a Chinese medical doctor who is a quick study and who does not believe in the Mythos; a quick-witted, fast on the draw private investigator; a strong-minded archaeologist with fast reactions; a resourceful Sikh scientist with a knowledge of weird scientist; a strong-willed gun moll with a knack for disguise; and an expert big game hunter and explorer). This all sounds like a not unreasonable set-up for a campaign, but the authors of The Two-Headed Serpent actually state upfront in the player introduction that the Caduceus Foundation is a front for an organisation dedicated to fighting elements of the Cthulhu Mythos. Such a set-up is not only brave, but also radical in comparison to every other campaign for Call of Cthulhu, wherein the set-up is that the investigators are unaware of the Mythos or the mystery at the start of these campaigns. Nor is this set-up really a spoiler, because the heroes will pretty quickly learn the same facts in-game as the players have just learned them out of game. The set-up to The Two-Headed Serpent also both prepares the players and their player heroes for what is come and establishes the tone for the campaign before throwing the heroes into the action. Fundamentally, The Two-Headed Serpent is not a dour, methodical, investigative procedural, but a fast-paced, action-orientated jaunt to some Mythos hotspots old and new, and this frankly jaw-dropping set-up gets player and hero alike ready for it. The campaign opens in 1933 in the midst of the Chaco War between Bolivia and Paraguay with the heroes ostensibly delivering fresh supplies to an aid camp. Then they are ambushed, and so The Two-Headed Serpent is off to the races. Over the course of the campaign, the heroes will find themselves undertaking a wide variety tasks, whether it is uncovering an ancient temple from Earth’s ancient past whilst fending off strangely determined military intervention in Bolivia; investigating the Mafia’s interest the Caduceus Foundation in New York; researching the cause of an outbreak of a deadly disease in North Borneo and coming face to face with some very weird flora and fauna; or investigating a newly arisen snake handling Christian preacher in the Oklahoma dustbowl. There are nine chapters in The Two-Headed Serpent, each named after a location and each actually quite short. In fact, the majority of the chapters are really only going to take a session or two to complete, so the whole campaign can be played through quite quickly. For the most part, the chapters are straightforward and the campaign fairly open in terms of the order which its chapters can be tackled. Initially, this will see the heroes’ employers revealing just a little more about their actual aims and sending them back out to a hotspot to investigate something strange going on. The New York chapter differs from this in that the Caduceus Foundation having its headquarters in the city means that the heroes will return there again and again, each time having learned something new about their mission and their employer. The likelihood is that events of the New York chapter will play out over several chapters as the heroes get distracted by other missions and lines of investigation. What they learn is that Caduceus Foundation is facing an enemy race from Earth’s long prehistoric past which wants to retake the planet which was once theirs and if it has to be rid of some jumped up, primitive monkey-descendants, then so be it! As the heroes delve deeper into the campaign, they discover that the remnants of this enemy race are not united in their aims and ultimately, they may need to side with one faction or another—if not play the factions off against each other—in order to prevent the end of the world. Along the way, the heroes will uncover conspiracies, get involved in organised crime, encounter the dark secrets of a benevolent preacher, find themselves dodging dinosaurs deep in the jungle, sneaking into volcano lairs, experimenting with ancient advanced technology, engaging in a MacGuffin hunt in the ‘City of Joy’, possibly undergoing a transformative experience, racing across an old, old continent to save the world, and of course, cheating certain death. The Two-Headed Serpent is after all, a campaign for use with Pulp Cthulhu, and such a campaign should include such mainstays of the Pulp genre. The Two-Headed Serpent. Alongside the staging and other advice on running the campaign for the Keeper, the campaign includes reports from its three playtests. These are highly entertaining because each playtest group approached the campaign in a different way, whether that is cautiously a la a standard Call of Cthulhu style, in a Pulp style with lots of action and danger, or embracing the weird aspects of the campaign. This is a great touch as it helps prepare the Keeper for how his players with approach the campaign themselves. The Keeper will need to carefully read the campaign for although it is straightforward enough, the aims and objectives of the various NPCs are not always so and the Keeper will need to handle some of them just as carefully as to when and how they interact with heroes. There is also advice for running the campaign using the standard rules for Call of Cthulhu, but that would take some effort upon the part of the Keeper and it would need scaling back a very great deal if the investigators involved are to have a decent chance of survival. Physically, The Two-Headed Serpent is nicely laid out and done in the now Chaosium house style. This both a good and a bad thing—mostly good. On the plus side, the book is done in full colour, is decently illustrated in both sepia and full colour, and the layout is clean, tidy, and accessible. In fact, some of the artwork is excellent, the image of a sea serpent crunching down on a seaplane is terrific, as are the illustrations of the campaign’s major NPCs. The maps are slightly variable in quality, the maps of countries possessing a little more character than those of the more fantastic locations, which feel slightly bland. On the downside, the book needs another edit in places, especially towards the end where there is an amount of repeated text. There are unfortunately two issues with the artwork. One is the lack of it in that none of the pieces of the technology presented in The Two-Headed Serpent are illustrated. This is such a shame and such a missed opportunity. The other is an ongoing issue which has been an annoyance and a blight upon previous releases for releases published for Call of Cthulhu, Seventh Edition. This is with the portmanteau galleries of each chapter’s NPCs’ portraits, which collect them together rather than placing them with their relevant stat write-ups at the end of each chapter. Putting aside the fact that some of the portraits do not fit the description, placing the NPC portraits together only benefits the Keeper, because they cannot be used as handouts. In other words, the Keeper cannot simply show one portrait to his players without their seeing the other portraits. The absurd lack of utility to this design choice is completely compounded by the decision not to use it elsewhere in the book. It is not used for the campaign’s major antagonists. Neither is it used with the given pre-generated investigators, so the question is, why is it used for the lesser NPCs? It adds nothing to the campaign and is instead, an actual hindrance to the easy running of the campaign. It is such a simple matter to change and one really has to hope that the forthcoming reissue of Masks of Nyarlathotep will not suffer from the same issue. In concentrating on the action, one thing that is lost in The Two-Headed Serpent is verisimilitude. From Bolivia and Borneo to the Belgian Congo and Calcutta, the campaign visits exotic location after exotic location, but it feels just a bit too fleeting and there is never the chance to add much in the of local colour and detail. This is more of an issue in later chapters, but it does lend the campaign a certain superficiality. It also explains why one of the better chapters is actually Oklahoma because it involves more roleplaying and interaction and investigation than the other chapters sometimes do, and because its emphasis is on that rather than action, it serves as a breather in the campaign, a change of pace. This is not to say that the other chapters are not fun—the volcano scenes in Iceland are certainly that, as are the scenes involving the Mafia in New York. What it does mean is that The Two-Headed Serpent needs to be carefully paced to allow time for the players to take in what their heroes have learned and for their heroes to investigate the various tomes and technological gewgaws they are likely to recover. The arrival of a new campaign for Call of Cthulhu is always welcome and none more so than The Two-Headed Serpent. Obviously in this case because it is the first campaign for use with Pulp Cthulhu and it sets the standard for future campaigns, but it also showcases the style and mechanics from that supplement. Which includes facing down Mythos threats rather than running away, shrugging off hits and Sanity losses, and spending a whole lot of Luck to escape by the skin of a hero’s proverbial teeth. 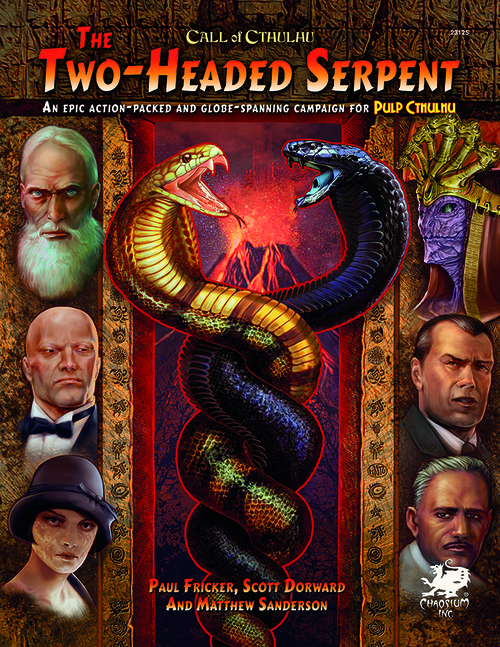 The Two-Headed Serpent: An Epic Action-Packed and Globe-Spanning Campaign for Pulp Cthulhu is big, is bold, and lets hero and heroine alike stand tall and laugh in the face of the Mythos. Then punch it right on the snout and run away as the volcano explodes behind them.